We’re keeping things simple this year and exchanging only homemade and handmade gifts in our little family and in larger gift exchanges. I’m very limited in my crafting abilities and desires (though I’m a great appreciator!) so we checked out Renegade Craft Fair in Williamsburg, Brooklyn, in hopes of finding the perfect presents. This was the largest holiday craft fair I’d ever been to and I was struck by how many booths lined both sides of the tents. It was inspiring to see so many people doing what they love! 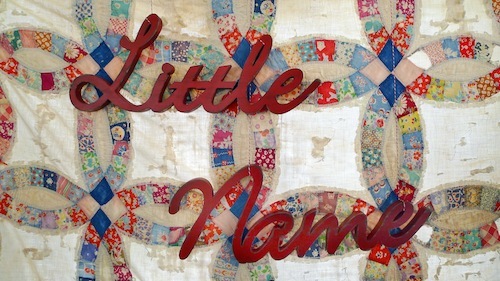 Everywhere I looked I saw something I’d love, but a brand new shop called Little Name stole my heart from first glance. Alexis G. Mcvicker is the sole creator of all Little Name products and has worked for companies like Anthropolgie and Osh Kosh b Gosh. 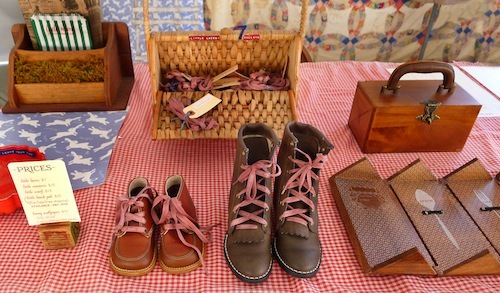 On display at Renegade was a four-piece collection of stylish products that cleverly double as educational: mauve shoelaces printed left and right; scarves that double as checkers boards; old-fashioned lunch pales with flatware outlines; mathematic coasters. The shoelaces! You can buy it all here. And of course, Alexis was as charming as the goods she makes and collects. There’s something so special about buying a product directly from the person who made it, especially around the holidays. Will you be making presents this year? Have you ever had an exclusively handmade holiday? Any favorite handmade online shops or local boutiques? Aren’t those the cutest? And I love that they’re pinkish but totally unisex. I love giving handmade for the holidays! We are trying to give almost all handmade gifts to our family and friends this year. Many of them will be coming straight from my Etsy shop- http://www.plumfieldshop.etsy.com – but anything I can’t make myself I will be buying from other talented Etsy sellers! What a lovely shop, Lauren! You’re so right! 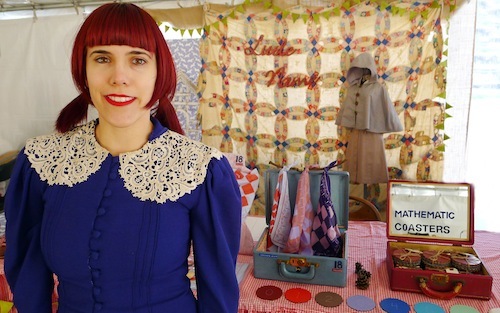 She was my favorite booth at Renegade too! And what a sweetheart. Her products are so thoughtfully designed, and functional. I love them! This is one of those situations where it’s obvious she’s going to be a big success some day, so I’m going to catch on to her now! Awesome that you were there, too. I thought the same thing about her. She is going to be huge and I can’t believe I was there to see her her ‘opening day’! I own a shop in a small seaside town in Massachusetts. At HomeGrown I carry only things that I’ve made from embossed paper prints to my own line of handcrafted polymer clay wearable art called Boston Baked Beads. Realizing how tough it can be – at the same time SO rewarding! – to try and make a living as a maker/artist, I always try and buy handmade and appreciate it when others do so as well. It tickles me so when people appreciate a good handmade gift. You can find some of my products in my Etsy shop: http://www.etsy.com/shop/BostonBakedBeads – otherwise you’ll have to stop in and visit me in Duxbury, MA! I totally bought that little checkerboard handkerchief from her for my daughters stocking at the holiday renegade! So cute! I can imagine that accessorizing an outfit and it’s so adorable. Oh my goodness! I went to school with Alexis! She is truly a sweet person – and so talented! Oh, that’s so awesome! Small world. . . i am so very touched by this article and everyone’s wonderfully sweet comments. thank you so much for your charismatic support and kind words ! I hope that everyone has a beautiful holiday season !